Last year's Border Leicester champion sold for 2,200gn. Sheep breeders from across the north of Scotland will descend on Thainstone later this month for the mart’s annual show and sale of pedigree rams. The event, organised by Aberdeen & Northern Marts (ANM) with sponsorship from animal feed firm Harbro, takes place on Tuesday September 25. A total of 725 entries are forward. These include: 266 Suffolks, 277 Texels, 22 Bluefaced Leicesters, 17 Border Leicesters, 44 Charollais, 25 Beltex and 74 entries of other breeds including Rouge, Vendeen, Blue Texel, Millennium Bleu, Blue Du Maine and cross-breds. “We have a strong entry of quality rams forward,” said ANM deputy head of livestock Colin Slessor. 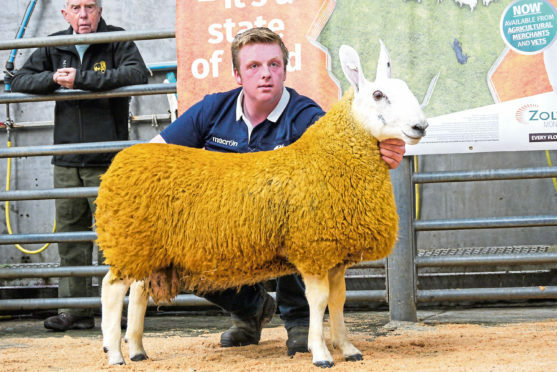 Among the entries forward is a shearling Texel ram being auctioned to raise funds for the My Name’5 Doddie Foundation, funding Motor Neurone Disease research. Put forward by Banchory farmer Rodney Blackhall of The Green at Raemoir, the shearling is by the 32,000gn Arkle Yingyang and out of a dam by the 15,000gn Kelso President. The event kicks off at 8am with judging of the Suffolk rams, followed by Bluefaced Leicesters at 8.30am, Border Leicesters at 9am, Charollais at 9.30am, Texels at 10am and all other breeds at 11am. The sale starts at 9.30am in ring two, beginning with the Suffolks. A line-up of judges from across the region have been selected for the event. These include Shetland breeder Brian Anderson for Texels, Jonnie Campbell from Thurso for Suffolks, Neil Eddie from Montrose for Beltex and cross-breds, Alan Bradley from Huntly for Bluefaced Leicesters, Michael Shearer from Thurso for Border Leicesters and Ryan Shand from Huntly for the Charollais section. At last year’s sale, a top price of 2,200gn was paid for the Border Leicester champion from veteran breeder Jimmy Douglas, of Cairness, Fraserburgh. Bought by Bruce Mair for Christine Williams and Paul Tippets, Shifnal, Shropshire, the sale topper was by Muirmonth Mustang, bred by Sandy Haggart, Muirmouth, Crieff. The overall champion from the pre-sale show was the leader from the Texel section – an entry put forward by Robbie Wilson, who runs the Milnbank flock at North Dorlaithers, Turriff. By the 60,000gn Strathbogie Yes Sir and out of a ewe by Strathbogie Untouchable, he sold to Elma Alexander, Auchenbreddie, Insch, for 1,600gn.